I’ve been in search of the perfect recipe for coconut yoghurt. The first one I used is a bit hit and miss when it comes to thickening and I can’t ever really work out why. It is great when it works, but too thin when it doesn’t. Draining it helps, but honestly that is messy and a bit of a pest. It is also very high in fat compared to dairy or soy yoghurt, which means I have to eat less of it, which isn’t good, since I love yoghurt for breakfast, snacks and desserts. 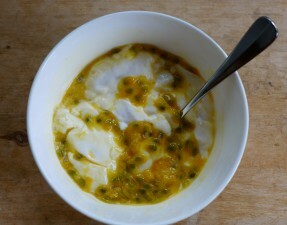 So when I came across this recipe for coconut yogurt on Lexie’s Kitchen I was thrilled. It involves setting the yoghurt with the help of some tapioca starch and agar cooked in water, which is then mixed with the coconut cream. As there is quite a bit of water in the final mix, the fat content is much lower, but the texture is pretty good and is like thick greek yoghurt, though not as rich. It takes a bit more effort, but it is worth it. I got my non-dairy yoghurt culture (the SYAB1 strain) at Green Living Australia. This recipe is definitely a keeper. I’m currently eating it with passionfruit that are staging a takeover bid in my garden. coconut milk yoghurt - third time lucky! You need everything to be clean so that the wrong bacteria don't get into your yoghurt and make it go off, so clean everything by dousing in boiling water. In a small bowl, mix the tapioca starch and ½ cup water. Set aside. Add 2 cups water to a large pot. Sprinkle the agar powder over surface. Bring to boil and gently simmer for 5 minutes or until the agar is completely dissolved. Give the tapioca mix a stir and whisk it and the sugar into the agar agar mixture. Return to simmer, stirring constantly for 1-2 minutes. It will thicken. Whisk in coconut milk. Heat just until steam rises from surface. Allow milk to cool to 95-100˚F. This can take a while. Do not get impatient. If you put starter into a hot mix, you will kill it. Sprinkle the yogurt starter or probiotic (use manufacturer's recommended measure) over surface of the cooled milk mix and whisk very well. Transfer to container(s) and then to the yogurt maker. Leave undisturbed to ferment for 8-10 hours. Transfer to refrigerator and chill 6-8 hours. The yogurt will set as it cools. Don't put too much agar in or you'll end up with a jelly. It is better to err on the side of less, rather than more, so use closer to ½ teaspoon than 1 teaspoon. I want to try this! Re cooling the milk – does this need to be measured with a thermometer? Or is an approximation OK? Any guidelines if guessing? I did mine the first time with a thermometer, then realised it wasn’t that critical. You need baby’s bottle temperature. It should feel neither hot nor cold. Wow, the texture of that looks amazing! I’m keen to get back into some yoghurt making soon – I used to do it all the time, but haven’t had a crack at it again since finishing my travels and moving back into a house. I’ve only really done soy yoghurts too, although i’ve used store-bought coconut yoghurt for a starter. I’m really keen to experiment with non-soy alternatives though, as I try to make sure I don’t overload on the stuff. I like the idea of ‘diluting’ the coconut with water, because I don’t really like the richness of coconut yoghurts like coyo. Thanks for sharing this – i’m definitely going to bookmark it for later! the best I have made of all the vegan yoghurts.